Today is the day – our new course “Crushing the King” is released! If you want to improve your attacking skills and boost your chances of success, then this course is for you. Attack is an art that every chess player should master. When we play a chess game it is very important to have the ability to start an attack in order to win the game. Many students have the problem in starting the attack and in the delivering of the final blow. They do not know how to provoke weaknesses in the position of the opponent’s King . 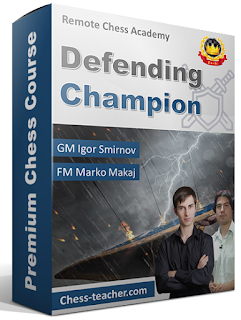 In this course I (Igor Smirnov) together with CM Tryfon will teach you the strategies and tactics of attacking. At the end of this course you will have all the necessary abilities and understanding in order to start a successful attack against an opponent of any level! The course is suitable for beginners and intermediate level players, but it will be helpful for advanced level players, too. Even if your ELO is 1900+, this course will help you improve your attacking skills and you’ll learn some new things. >> How you can become a great attacker? >> How can you get an attacking position? You can get this course with a huge 20% discount, saving about $20 USD. Simply use the coupon “crush20” when making the purchase. If you don’t know how to use a discount code, please see here. This is a limited-period offer: it will be valid from today till Friday, 3 Mar. (inclusive). Moreover, if you’re among the first 75 buyers of “Crushing the King”, you’ll get a HUGE bonus – you’ll get our premium course “How to beat titled players?” completely FREE! Let me remind you that the pre-registrants for the course were already informed about the course launch. Therefore, the race to “first 75 buyers” has already begun. 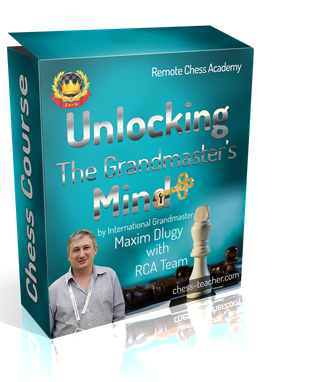 Note: if you’re one of the first 75 buyers AND if you already own the course “How to beat titled players?”, you’ll be provided with a $59 USD gift voucher on RCA products. We’re also providing you with another great offer – “Master the art of Attack and Defense”! When one player attacks, another one defends. Learning both of these interconnected topics makes you a true master! You can get both of courses “Crushing the King” and “Defending Champion” and save $39 USD along the way! Additionally, you can use the 20% discount coupon on this combo as well, saving further $19.8 USD (saving a total of almost $60 USD – that’s really massive, isn’t it?! 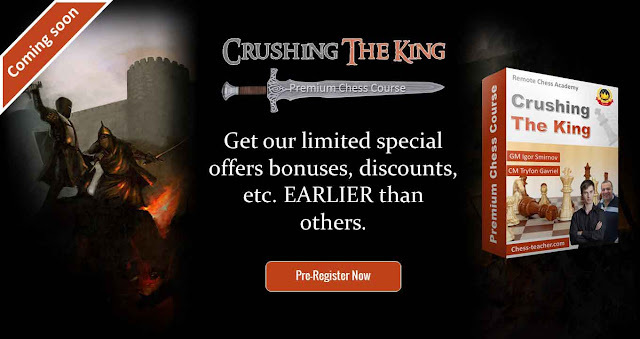 :)) You can find and choose this ‘combo offer’ when you purchase the course “Crushing the King”. P.S. Guys, after the study of the course, please write your impressions in the comments below. It will be very interesting for me, as well as for all the other students, to hear your feedback. Thanks in advance! First, I’d like to remind you of the survey we’re conducting to know your needs and wishes. Please take part in it and let us know what kind of courses and lessons (chess topics that interest you or the areas in which you face problems) you want from us. As a “thank you” for participation, you will get the summary of top three RCA lessons of 2016 for FREE! Take the survey now. Note: this is the FINAL reminder for you – this survey will be closed tomorrow (19th). So don’t miss to tell us what you need! In the previous article, we discussed about 5 biggest problems in attack and how to solve them. Today we’ll move forward to the next important thing about attack in chess – the basic conditions for a successful attack. One of the frequently asked questions by the chess players, after ‘deciding’ the target for the attack is: (WHERE), “WHEN should I attack?”. Later, they face another problem – “HOW should I attack?”. How pawn structure determines a successful attack? Charles Campbell is one of the highest rated players in Nigeria and a member of the Nigerian National chess team for 15 years. He has represented Nigeria at various international events, most importantly at the World Chess Olympiad and All Africa Games. He excelled at the World Open in Arlington, Virginia in 2014 as well as at the Tradewise Gibraltar Chess Festival 2016. He also won the 2015 National Friends of Chess tournament in Nigeria and tied for the first place at the 2016 CPAN Chevron Chess Challenge also in Nigeria. His deep passion for the game of chess and strong belief in its educational benefits led him to the establishing of the Candy Chess Academy, the pioneer scholastic chess academy in Nigeria. He runs a very successful coaching program in Nigeria and in Louisiana (USA) and has discovered and developed some very strong players and Champions of all ages. Charles has three international titles: CM from the World Chess Federation (FIDE), NM from the Nigeria Chess Federation (NCF) and NM from the United States Chess Federation (USCF). P.S. Our next course is “Crushing the king” and will be released soon. We’ve published a short teaser video of the course – you can watch it here. Stay tuned for more! 5 biggest problems in attack and how to solve them! First, let me remind you of the survey we’re conducting to know what YOU really want from us. Please, let us know what kind of course (key topics or where you have troubles) you want us to create. As a thank you for participation, I’ll provide you with something really cool – you will get the summary of top three RCA lessons of 2016 for FREE! Attack in chess is a fundamental topic, because without an attack we cannot win a single chess game. Perhaps strong players and titled players can attack easily as they know almost everything regarding attack, but if you are not this ‘strong player’ then you might have some problems. Chess is a game of understanding. Before doing anything we need to understand what is going on. There are some positions in which the opponent’s King is safe and in some other cases he is not. For instance, we should castle as soon as possible, am I right? If the King stays in the center, then we can use its position and we can start attacking him. In our previous survey one student asked a very important question: “I do not know when I can start the attack and what the most efficient way to do it is?” Indeed, firstly we need to understand that the opponent’s King is in a bad position. Sometimes we can start the attack out of the opening. There are some techniques and aggressive openings, where you can start attacking straight away. Strong players know them and they can attack successfully. But, how can a not-so-strong player do it? 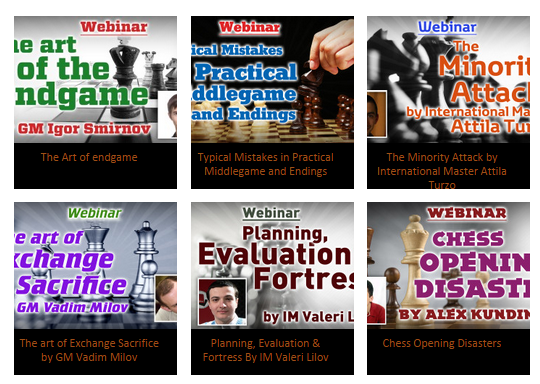 you may like to see the “Best chess openings and how to pick one for you”. In order to attack we need to have a more active position. We should generate threats. In order to do so we need to activate our pieces, pieces that can create new threats. Here I’d like to share a very important tip with you. Weak players try to improve any piece separately, but strong players know how to coordinate all of their pieces. You need to connect and coordinate them in order to create even bigger threats. Let me share with you a quick tip. In order to calculate properly you need to calculate the forcing moves first. How to finish the attack? Last but not least is how to finish off the attack. Sometimes we are so close but unfortunately our opponent can run away with his King or he can find an escape route. I’ll not lie to you. In order to finish the attack and get the whole point (to win), you need to secure the mating net. We need to control the squares around the opponent’s King; this is what we call “the mating net”. Finally, I’d like to know your thoughts about these five important aspects of attack in chess. What do you think about them? How should one make a successful attack? Or, do you face some problems when it comes to attack?